This beautiful reserve, Kilima, boasts an abundance of wildlife, mountain forests and savannah grasslands making it undoubtedly the perfect getaway for anyone wanting to experience the African bush at its very best. There are six room options catering for all travellers. The reserve is also very proud to offer a wheelchair friendly room being the Small Suite which is an en-suite room with a king bed, air-conditioning and a TV. The Medium Suite has the same features as the wheelchair friendly suite. The Small Suite has a queen sized bed and private bathroom. 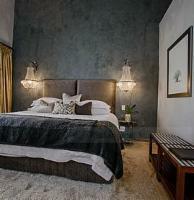 The Honeymoon Suite and King Suite or the epitome of luxury with super-king beds and private bathrooms. The Luxury Safari Tents are a new addition and have a private bathroom, kitchen and braai. The numerous attractions close by include Kruger National Park, 2000 year old Boabab Tree, Leydsdorp Hotel, Khamai Reptile Centre , Tzaneen Lion and Predator Park, Daktari Wildlife Orphanage, and Mhangela Animal Touch Farm. Various spa packages, game drives and game walks are also available at the accommodation. Big Game safety policies - if not checked in by 18:00 guests could lose deposit. No smoking in rooms, lounge and restaurant. Kilima Private Game Reserve and Spa is 0.9km from the centre of Gravelotte , the nearest airport 67.7km (Eastgate Airport).